Lyon County surrounds Emporia which is known as the "Front Porch to the Flint Hills." 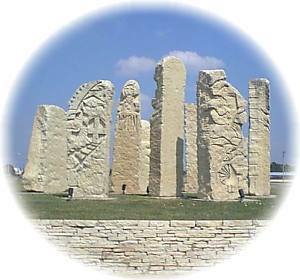 Prairie Passage Stone Sculpture reflects Emporia's role as gateway to the Flint Hills, depicting the land, its forces and its people. One of the distinctive features of the Flint Hills is the mix of farmers and ranchers. Nearly all farmers in the Flint Hills also raise livestock, while nearly all ranchers in the region also raise crops. In historic times, the two Native American tribes that inhabited the Flint Hills were the Kansas (or Kaw) in the north and the Osage in the south. Early white settlers to the Flint Hills were British, Swedish, Welsh, German, French, Slavic, and Mennonite. The Exoduster movement in the 1870's resulted in the resettlement of African-American ex-slaves onto small farms, while in the years around the turn of the century Mexicans were brought in by the Santa Fe to work on the railroad. In more recent years refugees from Southeast Asia have moved into the larger Flint Hills towns. In the spring, the Flint Hills becomes a natural wonderland with the grasses and wildflowers. The barren landscape becames green and lush attracting over 200 kinds of birds including hawks, robins, blue jays, meadowlarks, and eagles. There are 29 kinds of reptiles and amphibians, such as turtles, snakes, and armadillos. There are also 31 species of mammals. The Tallgrass prairie National Preserve was designed to protect a portion of the largest remaining unbroken tracts of tallgrass prairie left in the world.